Yes, I know, it is only August, but it's Hobby Lobby and the Dollar Store's fault. Really! They made me do it......... Ok, actually, we want to have an Adult Halloween Party, so I'm trying to get a head start. The hat ($1.99) and sign ($3.99 plus used 40% off coupon!) came from Hobby Lobby, along with the fabrics. I picked up the crow at the Dollar Store tonight and will be heading out in the morning to buy more! The hat was plain black felt it needed some bling! So I used spray glue on it, then covered it in purple glitter and added the ribbon. Much Better! The base of the wreath is a wire coat hanger. Simply untwist the neck of the hanger, straighten with pliers then twist the two ends together to make the wreath. The wreath ends up about 13" in diameter, although you could make it smaller. 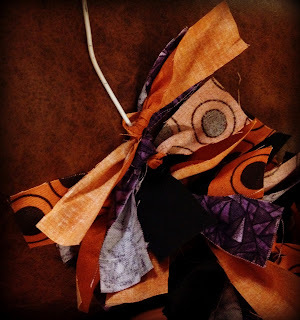 To cover the wreath, you will need 1" x 6" strips of the 4 fabrics. 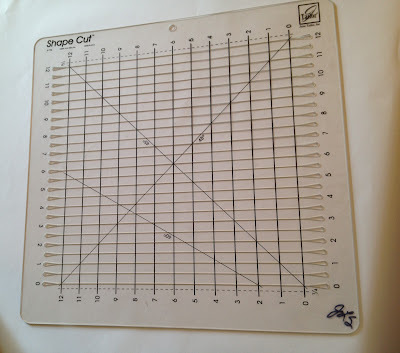 I use a rotary cutter and my June Tailor Shape cut ruler. 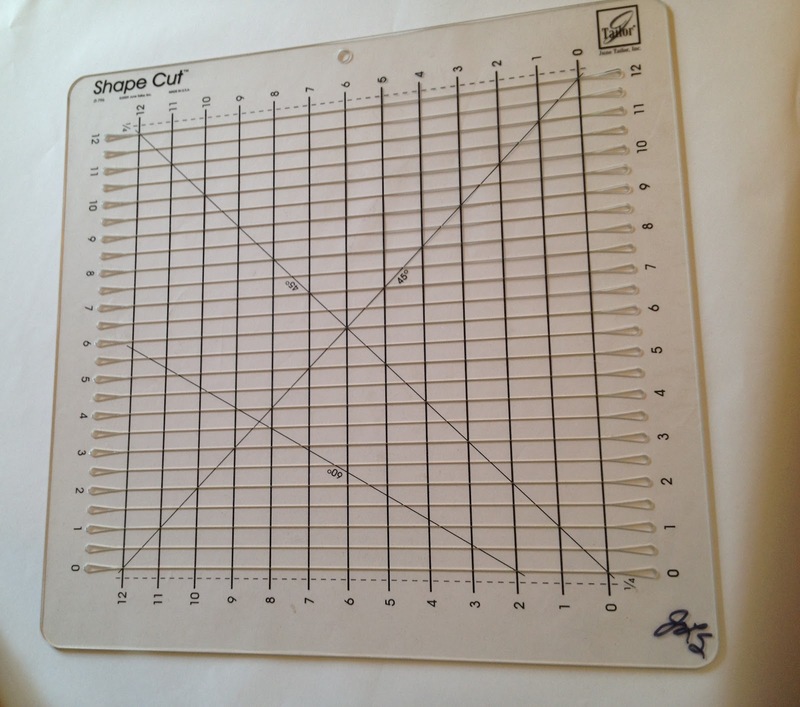 It is a great tool to quickly cut strips of fabric for crafting or quilting. Check out this June Tailor Video How To on YouTube to learn more about it. I think I got mine at Hobby Lobby - with a 40% off coupon - of course! Continue tying strips on the wire form until it is completely covered, pushing the strips as tightly together as possible, to make the wreath as full as you can. Then tie on the Happy Halloween sign, glue the hat on and wire on the Dollar Store Crow and you have a cute Halloween Wreath that you can use for many years to come! I don't know about you, but I'm starting to smell FALL in the air! Even though it still feels like summer here in Crosby. Absolutely adorable! Love the purple accents! Please link it up to the Pomp Party this week to show it off! I'm pinning it anyways...LOL Great job! Thanks Jill! I just linked up with the party! Thanks for the invite! We linked up to your Party! Oooh! I love wreaths - and this one is so pretty! Thanks for linking it up to our Keep Calm & Link Up party - hope to see you again next week! Thanks for hosting such a fab party! Jeanette, this is too cute! I'm featuring this on my Facebook page tonight! Thanks again for linking up with us at Keep Calm & Link Up!! Thanks so much Meredith! I like you on FB now! I love how this is both so easy and so cute! I love that combination. Found you from Tutus and Tea Parties. I will Pin this! I also have a link party but it's just for the fiber arts! Would love to have you! Thanks Sara! I'll join the party on Wednesday! This is SO STINKIN' CUTE! I love it! Heading to Hobby Lobby tomorrow...my second home :} So glad I found you via Create Craft Love today! Don't forget your coupon! Thanks for dropping by and I'll be stopping in for a visit at your place! Thanks Tonna! I'm very pleased with it and it is already hanging up in the house! Just too darn cute to put away. Thanks for following us and I'm your newest follower too. Your blog is just too darn cute! I love the design - did you make it yourself? Love it! I love this wreath. Thanks so much for sharing at my Our Favorite Things Link Party. 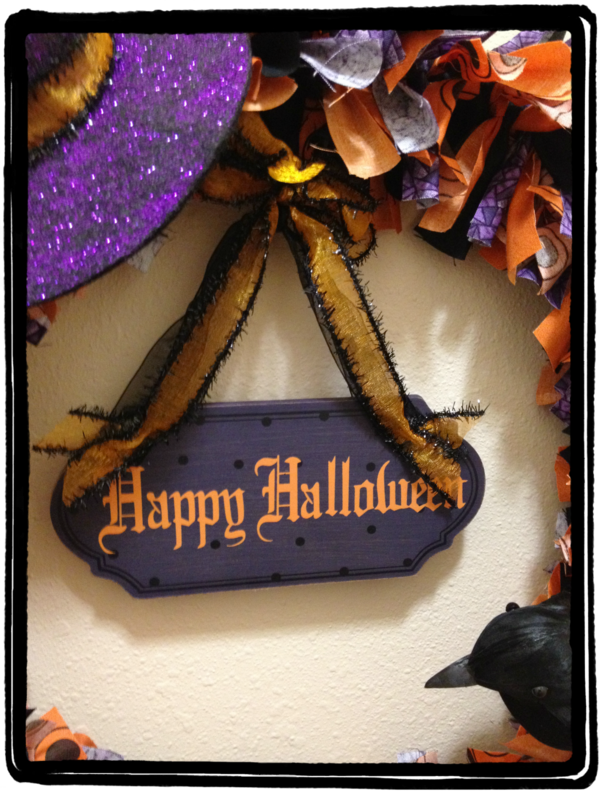 I did read in your Homegood's post that you were give orders to not have any Halloween up until October, so is your wreath up? Yes, she already put it up. It is rather cute, so I guess it can stay up, not like I have a choice lol. My no-decorating-early-for-holidays mentality came about because places like JoAnn's and Michael's always put out Christmas stuff in June and July. It's summer for crying out loud! And I love Christmas as much as the next guy, but June is a wee bit early for my liking. I love this wreath. I'll have to make one too. Oh, and by the way thanks for entering my Annie Sloan giveaway. You WON!! contact me with your shipping info please!! Woohoo! I can't wait! I never ever win anything, so this is a really big deal for me! I sent you an email with my info! I love your wreath - so cute. I can't wait for Halloween!!! I can't wait either! As you can tell from my "Way too Early" Halloween posts! Such a cute idea. I am loving purple as a Halloween color! 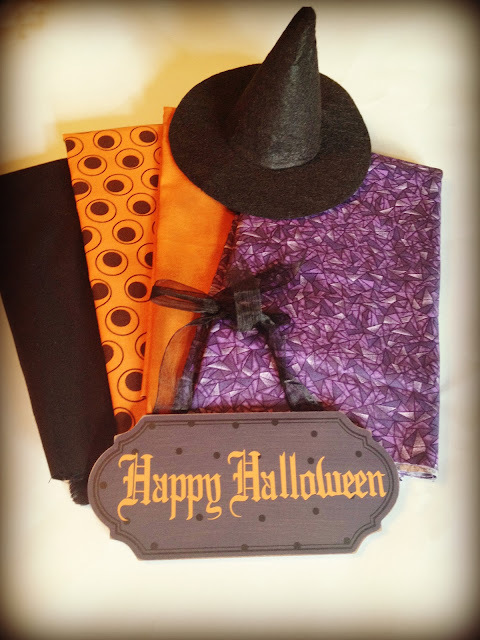 Purple is one of my favorite colors and I love to use it with orange and black for Halloween! Thanks for dropping in to see us! So simple, but sooo adorable! Love it. :) I can't wait for fall! i LOOOOOVE that wreath! that little witches hat? such a great touch! Newest GFC follower. Visiting from Welcome Wednesday. Thanks so much T!na! Love your name like that - too cute! I'm your newest follower too! This is great! I love how good it looks compared to how easy it looks to make. I also love the addition of the purple! We don't use glitter in our house, but I do love the purple glitter witches hat! You did an amazing job! I love it. Love the colors too!! HUGS sweet friend. You are too sweet Kathy! Thanks so much for the HUGS! 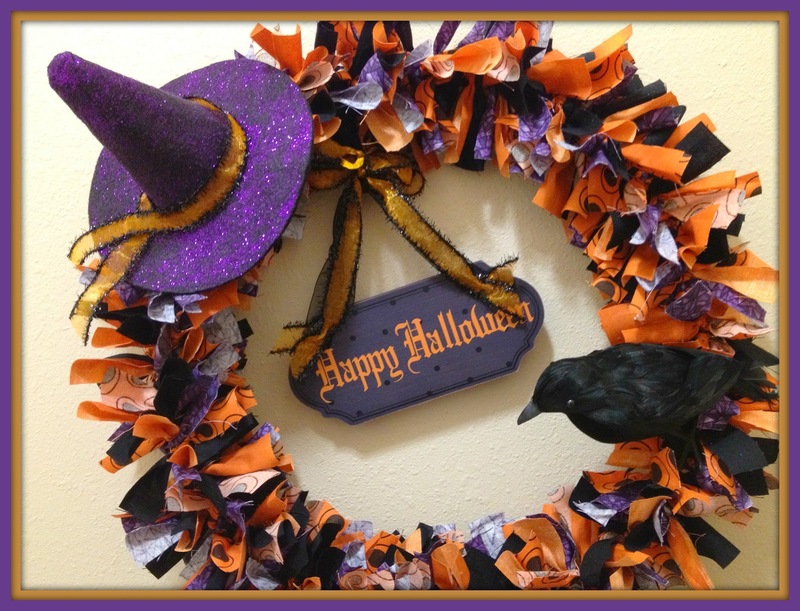 This witch wreath is awesome!! I am pinning it to my Halloween Board. Thanks for sharing. 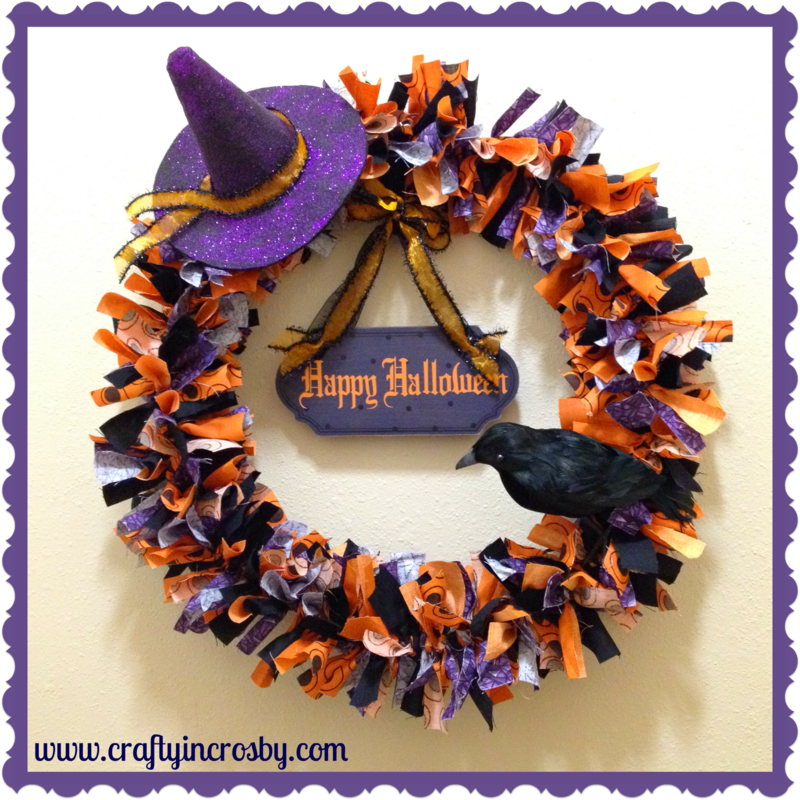 Love this Halloween wreath! I think the witch hat and black crow just make it so fun! I am already thinking of Halloween too. Thanks for sharing at Gettin' Krafty With It! That is super cute! I absolutely love Halloween crafts, and this one is great! Nice job! I love the purple glitter you added to the hat. I'm glad you linked up to Take it on Tuesday! Love this wreath! I made a wreath similar to this with Jeans and Tulle. But I love the colors and just everything about yours! Thanks so much Alese! We would love it! I sent you an email. Thanks for dropping by! Wow! We are so honored. Thanks for hosting and for featuring us! Great and awesome color scheme. Thanks for sharing. I found this while looking for purple and orange images. 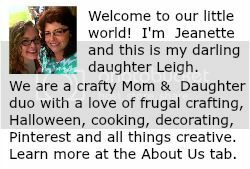 I Pinned it and also shared it with our group members on CafeMom - Holiday and Party Crafts - with a link back to your blog for the tutorial. Thanks so much! I really like this wreath! The little hat is so cute! Thanks! I still love it just as much this year! Wacky Weekday - Owl Always Love You!